One of the biggest worries I have about my upcoming trip is insulin storage. My three-year-old Maltipoo, Willow, was diagnosed with Type 1 Diabetes when she was six months old. She requires two shots a day, twelve hours apart. She also requires eye drops twice a day that require refrigeration. Keeping the insulin in a cooler is a decent option for overnight trips, but for our three night trip, I wanted something a little more reliable in case the Arizona sun melts all of our ice by Day 2. Unless I want to pack a noisy generator and a fridge, how am I going to make sure that the temperature fluctuations don’t spoil her insulin? When researching the issue, the answer was surprising easy to find. Just Google FRIO and the problem is solved. FRIO is a cooling case that uses gel insulation to regulate temperature for up to 2 days. You just soak it in water for 5-10 minutes and it will retain its cooling properties for 48 hours. But wait, I will be camping for 72 hours. What do I do? Well, after 48 hours, I will dip the FRIO in chilled cooler water/ice for another 5-10 minutes and I will be good to go for another two days. Or, if the ice water isn’t so “icy”, I’ll venture down to the nearby lake and recharge the FRIO that way. I researched other battery-operated products, but those cost hundreds of dollars and often didn’t carry a charge much more than 2 or 3 days. 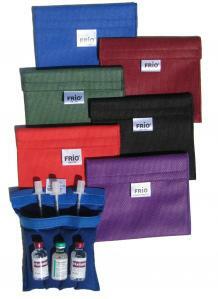 FRIO cases cost $20-$40 and require no electricity. 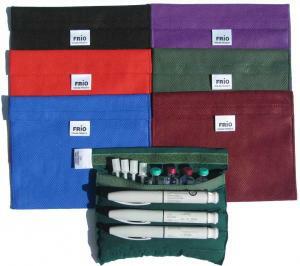 They are also very compact, an essential characteristic for any camping item.